On May 26th 2016, AeroVision organised the Drone Live-Demo Day in the framework of the CAPIGI GeoAgri conference. 21 booths and three timeframes of four drone-demonstrations, which included different types of drones, ensured that there was plenty to see and to learn. Drones flew with fixed wings, but also quadcopter models were demonstrated. The most striking demonstration was the falcon Robird. A seagull, who probably had a nest close by, obviously did not agree with the presence of the drone. In the various booths, visitors could get more information about more kinds and types of drones. But also information was available about various soil sensors, analysis techniques, software to process the data and equipment to carry out the task cards. Also autonomous robots who can carry out work in the field, such as taking samples, were shown. In short, the entire circle was visible: from the collection and processing to the use of the maps on the tractor. Also the latest developments in the field of satellite monitoring were brought to the attention. This day was freely accessible for farmers. The CAPIGI GeoAgri conference visitors arrived in a big touring car at the Drone Live-Demo. Partly because of the beautiful weather, it was a successful and enjoyable day. Special thanks to the sponsors and exhibitors. PPO Westmaas is one of Applied Plant Research’s field test locations. 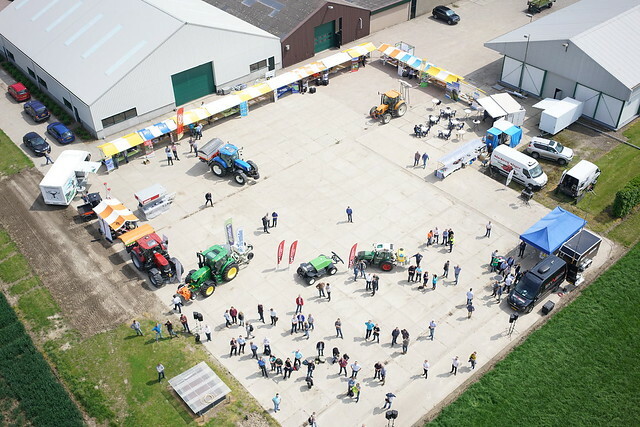 This Drone Live-Demo Day was organised in collaboration with CZAV, PPO Westmaas and ZLTO. The catering was provided by Slager from Sint-Annaland.